Fame, by the Duchess’s Community High School at Alnwick Playhouse. 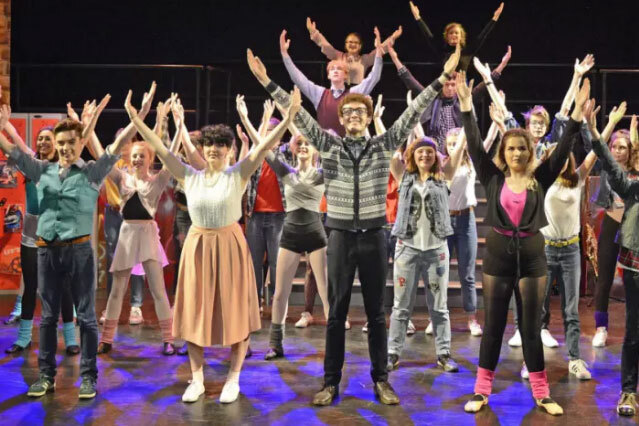 In almost 10 years of working at the Northumberland Gazette and its sister papers, I’ve reviewed hundreds of plays, musicals and performances on the stage. Some have been professional productions, others amateur. But this has to have been the best I have ever seen – these youngsters really did light up the sky like a flame. It’s not just the energy and enthusiasm that these youngsters show, or the fact that some of them are singing, dancing, acting and then playing a saxophone and violin on stage, it’s everything they put into their performances. Set in the 1980s, Fame follows the relationships of students at the New York Performing Arts High School (PA) as they traverse their two-year course in the different disciplines of music, dance, acting and literature. The show opened with a stunning musical performance that gave me goosebumps from the start. Powerful voices mixed with fantastic choreography set the scene for the duration of the show. The songs were out of this world, with solos galore, and that finale was spine-tinglingly good. Oscar Wilson was superb as Schlomo Metzenbaum, the slightly geeky kid. And Jamie McIntosh played on the role of Jose ‘Joe’ Vegas, the kid who likes to be funny and stupid, just brilliantly. His rap solo was one of my favourites, even if some of the lyrics were a bit x-rated. Jenny Clapcott was hilarious as Mabel Washington, the big girl with a bubbly personality who loved her food. She was a stand-out character and her voice was brilliant. And Isaac Ellis played the role of Nick Piazza, the conscientious student, perfectly. Ruby Faulke gave a stunning solo as Serena Katz, the timid and shy girl in love with Nick. But the stand-out performer for me was Emily Hardy as Carmen Diaz. She was utterly sublime. Her voice was so powerful, her solos perfect, her rendition of Fame was stunning, and her stage presence was just immense. She is a star in the making, and I wouldn’t be surprised to see her name in lights one day. Laura Murphy, as Grace ‘Lambchops Lamb, and Anna Maxwell, as Lydia ‘Goody’ Good, were great, and Ethan Allan played the somewhat nutty professor role of Mr Sheinkopf to a tee, while Ella Paul was brilliant as Miss Bell. And who could forget that amazing band, made up of school pupils – so much talent. Mention must also be given to the amazing choreography and dancers, the chorus, and each and every single person who helped to bring the show together, on and off stage. It never fails to amaze me the sheer talent in that school. Well done to every one of you – you are simply superb and you really will ‘fly high’. Cast: Ruby Falke, Isaac Ellis, Jamie McIntosh, Emily Hardy, Jack Clements, Cora Drummond, Jenny Clapcott, Oscar Wilson, Laura Murphy, Anna Maxwell, Sophie Murray, Ella Paul, Ethan Allan, Joe Bennet, James Anstee, Emily Breeze, Hannah Breeze, Georgia Brown, Megan Brown, Kate Buddle, Haylie Carter, Harry Clark-Thompson, Hannah Dawson, Star-Marie Kenrick, Martin Latto, Matilda Leng, Roisin Lyst Eleanor Morris, Erin Murray, Isabell Niles, Becca Pitcher, Harriet Renner, Antonia Scott, Megan Spours, Jess Swan, Palesa Thompson, Darcy Wood.